Headlining is revered trans musician, essayist and activist DJ Sprinkles, who has been re-drawing the connections between dance music and its indissoluble relation to queer culture. She’s joined by fellow New Yorker, Fred P. The Soul People Music boss is undoubtedly one of the finest in the deep house game - his acclaimed all night sets at The Pickle Factory have lived long in our memory, and we look forward to welcoming him back, this time to Oval. We can now announce that our final addition to this all-star cast is none other than hip hop turned funk and soul digging maestro Ge-ology. Another perennial Oval Space favourite, Geo returns on 14th July for his third performance in Bethnal Green in the last couple years. 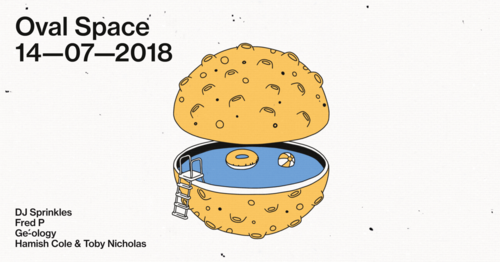 Warming the floor, support comes from the minds and record bags behind Oval Space and The Pickle Factory’s in-house programming, Hamish Cole and Toby Nicholas.